We always hear about Apple and how wonderful their products and technical support services are, and there is a good reason for these accolades: Apple knows what it is doing and continues to strive to offer superior products and services. However, not all of us can afford to make the types of investments that Apple products require you to make so we forced into buying less expensive brands. 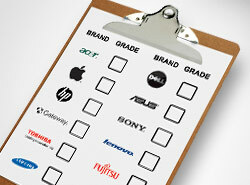 We know that Apple is one of the best brands on the market, but which ones are the worst? Which brands have products and Tech Support services that are so severely lacking that consumers should just avoid them all together? Acer/ Gateway has made some improvements to its overall product line and tech support services in the last year, but they still come up short to nearly every other computer brand on the market. While the laptops may looks nice, their overall functioning capabilities is low and most customers are highly unsatisfied as theses machines lack in overall longevity. Acer/ Gateway tech support agents are infamous for being unknowledgeable, and still receive the lowest rating in the industry. Samsung may be producing some of the coolest new smart phones and tablets on the market, but their laptops are lagging behind. Although they come with a sleek and sophisticated design, the Samsung line of laptops repeatedly scores low on innovation and software available, and the technical support is even worse. If you love Samsung, stick to supporting them by purchasing their smart phones and tablets. However, steer clear of their laptops if you want a great working and innovative piece of technology. Dell has some of the best tech support out there, it’s just unfortunate that their actually laptops and computers leave so much more to be wanted. If you want a computer solely for writing papers, then a Dell laptop would be a great option. But if you want a machine that is reliable, innovative, and has longevity, then a Dell isn’t for you. The split between those who would buy a Dell again and those who wouldn’t is usually split 50/50, but overall the brand is to be avoided for those who want a computer for serious use. While these brands do repeatedly pop up as some of the worst on the market, they do have a few exceptions. The Dell Inspirion has long been a favorite for traveling professionals and college students, and some of Samsung’s newer laptops are showing promise. However, as of right now, if you want a laptop with superior functioning and tech support choose a Lenovo, HP, or Sony. These brands are more affordable than Apple, and come with great operating systems, superior processing speeds, and superb tech support.